As simple as reaching puberty or a certain age, exotic cultures have prioritized maturity in their lives. In East Africa, there is a small city called Arusha which is north of Tangayika in Africa compiled with scattered homesteads, which consist of dominant males. In this indigenous society, males rank highest in the hierarchy and women are left with domestic work. The Arusha males revolve their lives around reaching the final stages of manhood. As they proceed through each stage, their maturity and prestige within the society progresses. Hence, Arusha males have focused their lives in a long quest into completing the stages of the maturation cycle. The Arusha males are divided into a formal structure of institutionalized age groups that determine their placement within society. In this city, people live in parishes, which are named areas with distinct boundaries, the residents of which consist of local groups (Gulliver 17). In order for a family or individual to become part of a parish, the male must obtain membership with in the parish. After the male has gained membership within the parish, he becomes part of an age group which consists of men of the same age. The age groups acts as a corporate entity and are conscious of the distinction between of older and younger groups of the parish (Gulliver 25). They recognize their common rights and responsibilities but they do not carry any major roles within the society. After a certain period, age groups are required to obtain manhood through formal stages and processes. After being assigned to an age group, they must enter formal stages of manhood based on age-sets. An age set is a set of coexisting age groups which have common names and all the members within the age group go through a series of promotions and rituals at the same time (Gulliver 26). Also, they are responsible for carrying out certain tasks as a group. Age sets usually acts as a unity but rarely do they act as a single individual. Once a male has joined an age-set, they are required to remain in that set for the remainder of their lives because rituals within the age set prohibit it. Within the age-set cycle, individuals are held accountable for responsibilities and roles which can be signified as age grades. Age grades labels the members through ranks, statuses and norms of behavior (Morton 72). In Arusha, they make a clear distinction between two primary grades- olmurrani, which is known as ‘murran ’ or young man, and olwayian, known as ‘elder’ (Gulliver 29). Before entering these principal age grades, there is a pre- group known as olayioni, ‘youth’. The olayioni are held responsible for herding livestock which hold no importance within society. On the other hand, the murran age grades are responsible for the military action. The elders are the most prestigious and carry out important tasks such as monitoring rituals. Thus, each stage of the age-set cycle consists of age grades which are a set of roles and normative behaviors. The first formal stage that youth must endure to begin their pursuit of manhood is the olayioni also known as ‘youth’. The age range for the pre group stages are usually from fourteen to twenty. This first process of the stage is called Edungore O Ipiron which is known as the closure of the circumcision segment (Gulliver 25). The ceremony begins at their father’s homestead where one to three youths can be circumcised together. The closing of the circumcision is performed by benefactors and a ceremonial leader who is responsible for organizing the rituals for the maturation cycle within that age-set. The ‘closing’ of a circumcision commences when the ceremonial leader casts a curse upon the knife which would be used for the circumcision (Morton 83). Then the ceremonial leader places a ritual of the ‘black stone’, a stone that they worship for religious purposes, to complete the closing of the circumcision period (Morton 83-84). The recipient that goes through the circumcision process must wait for a period of three years to begin the next process which is signified as the ‘opening’ circumcision segment. Representatives must obtain permission from a ritual expert to resume the circumcision period. Once the permission is granted, the ceremonial leader will perform a ritual treatment of the ‘back stone’ which ‘opens’ the circumcision period (Morton 83). Like the ‘closing’ ceremony, the male has to wait another three years to begin the next process. Unlike the other age grades, the pre-group holds little responsibility and prestige. They are held responsible for herding cattle and act as servants to elders within their families. They are to endure only through the circumcision period so they will be prepared for the next primary grade. The male is required to go through another cycle of closing and opening of circumcision before his promotion to murran hood also known as ‘young man’. Following the pre-group is a group called junior murran which is known as the servant age-set. In this age-set, the circumcision holds high significance because they learn customs of the murranhood. The age set is divided into different ranks which are the junior murran and the senior murran. The last circumcision period occurs during the junior murran grade. The first process of the junior murran hood consists of three spells of circumcision during the circumcision period (Morton 86). The spells are separated by virtual silence which can last from six to twelve years (Morton 87). Furthermore, the murran age-sets are also responsible for military action. They are distinguished between the junior military and the senior military. Each military division is provided with privileges and uniforms. The junior held very little responsibilities compared to the senior murran. For example, in war, the junior murran were to supple senior murran with weapons and they were provided with adequate training from the senior murran. In this society, the junior murran also had little responsibility such as roaming around the village and presenting their costumes and voices to the public. Basically, the junior murrans were meant to play subordinate roles. They carry out tasks that require very little skill or judgment such as fetching firewood at feasts or clearing an assembly place. The junior murran’s anticipation for promotion to senior murran is high because they spend a lot of the time with the seniors to gain knowledge until the day they take over (Morton 93). After proper ceremonies have been processed, the junior murran are promoted to the next level known as the senior murran. The senior murran set holds much higher responsibilities than the junior murran hood. For example, in war, the senior murran are the ones in combat and their responsible is to efficiently train junior murran under harsh circumstances (Ritter 154). The senior murran defend the group from invasions and increase the group’s wealth through raiding. They also have their own military that is divided into fighting units which have a certain leader and senior leader in command. They rarely act as individual units; they tend to act as a group which decreases injuries of the military organization. The senior murran are required to wear pigtails, costumes and spears because they were required to protect their groups at all times (Ritter 145).The costumes give an appearance and role distinction from other age-sets. Aside from military power and privileges, senior murran were granted access to unmarried women. They were granted power to demand food and materials from any homestead even though they were not related to the people in any matter. They were allowed to act upon polygamy if they wished. On the other hand, they were not allowed to accept beer or meat because they would have to reserve these precious resources to the elders (Morton 91). The end of the murran hood is also the ending of the maturation cycle. All the circumcision periods have been initiated in order to obtain man hood. At the final stage of senior murran, ceremonial processes remove murran restrictions such as meat eating within the parish. When the removal of murran restrictions is complete, the formal period of junior elderhood begins. The junior elder hood is now allowed to participate in ritual and politico jural affairs which are cases that involve the dispute and communication with other parishes. Unlike the senior murran, they are not required to initiate in combat. They are protected by the senior murran and are accompanied by them. The senior murran benefit from this because the junior elder hood advises them and provide them knowledge into preparing for the next stage. Among the other stages, the junior elder hood is the fast at learning ritual procedures, ceremonial conventions, and judicial techniques (Gulliver 38). They have less movement and spend most of their time in households acting as the head of growing families. They are freed from laboring tasks that was once required in the senior murran. Furthermore, they are not required to wear costumes, carry spears, or wear pigtails (Ritter 153). There are no restrictions on them drinking beer; much of their time is spent with other elders enjoying drinking beer. As the next age set transfers their prestige and title on, the junior elder hood is promoted to senior elder hood. As the stages progress, the participation in affairs starts to lessen. Most importantly, senior elder hood are known to be expert at rituals. They are able to act as ceremonial leaders and help those youths that are at the starting point at the age-set cycle (Morton 94-95). Senior elder hood are more family oriented where they stay at home and tend care to their families, herds and farms. They have sons that have obtained murranhood and daughters who have been happily married (Gulliver 41). Their sons have also made ownership of livestock and land. They also have moved on and started a family of their own. Furthermore, they participate less in beer drinking and feasts than the junior elder hood. At this age-set, they have the greatest influence on the other age-sets. As years pass by, the elder hood start to age and eventually they will have less will and power to carry on tasks so they are forced to retire. In this age-set, all participation has diminished. The retired elder is feeble and are ignored by others. They are looked down by young men because they are seen as useless. They are too old to carry out any tasks or even move. Their house hold is shrinking because all their children have grown and moved out to start their own family. They no longer have hierarchy of authority because their adult sons have taken that position. Their affiliation with the maturation cycle decreased and their control of property and ritual processes are left to their sons (Gulliver 42). At this point, they serve no purpose and in return they receive respect without the demand for special resources. 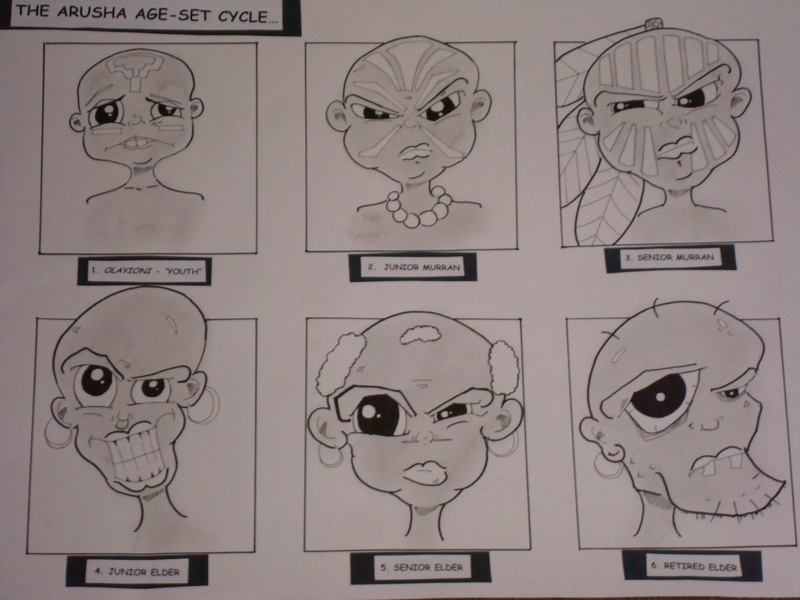 Consequently, the Arusha have prioritized manhood through the long enduring process of the maturation cycle. Each stage cycle holds its significance and as Arusha males progress to the next stage, they bear new responsibilities and normative behaviors. In Africa, there are many other cultures that follow this exact age-set system. Some have alterations within the example. For instance, the Nandi society’s age-set cycle takes twice as long as the Arusha society (Morton 77). The women in the culture hold very little power. They have no say or judgment on a regular day basis. Their only purpose is to act as servants to their husbands and to nurture the family The African culture has based their manhood on circumcision and the abilities to take control and protecting their group. On the other hand, western societies base manhood through puberty and age. World cultures prolonged traditional customs through this modernized time. They seem to have preserve their traditional ways as centuries have passed. Edinburgh UP, 1961. Structural Dichotomy and Jural Processes Among the Arusha of Northern Tanganyika.23 Apr. 2008 <http://www.jstor.org.ezproxy.xula.edu/action/showArticle&gt;. University of New Mexico, 1980. The Conditions Favoring Age-Set Organization. 22 Apr. 2008 <http://www.jstor.org.ezproxy.xula.edu/action/showArticle&gt;. Library 02 October 2005 77-102. 22 April 2008 http://archive.lib.msu.edu/DMC/AfricanJournals/ .